Hello Jen, I believe your plant may have been a Streptocarpus, Some nurseries sell a common one under the misnomer "Nodding Violet" But there are many other lovely varieties. These plants are related to African violets so perhaps contact your local society or a specialist grower good luck, Barbara. Hi Maxine Thank you for your answer. You are correct. 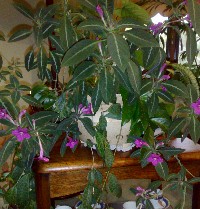 Its full name is Ruellia Makoyana. I have purchased a new one. The one I had was grown indoors, and was lovely. Is yours outdoors? Jen. Comment on "Name of Indoor Plant"